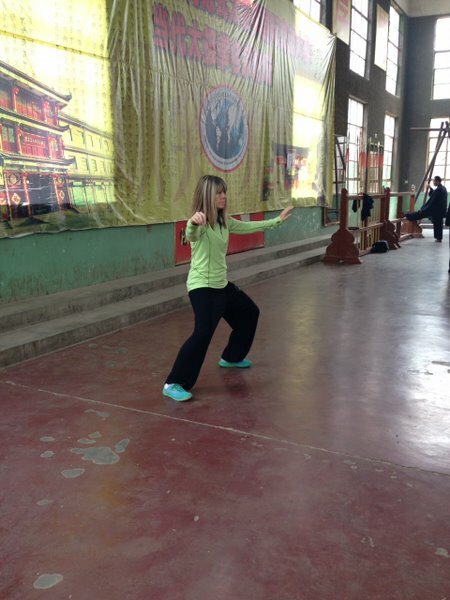 My big passion in life is Chen style taijiquan. I've practiced and taught taiji for the last 20 years, and originally became interested in the art because of the power involved. Chen style taiji is explosive and dynamic, using the legs and hips to control breathtaking displays of punches, kicks, leaps and stomps. If one practices taiji daily, for several hours each day, one can develop incredible levels of strength. Lou Reed was a great example of this - he studied in NYC with Master Ren Guangyi for many years, and practiced faithfully, achieving a high level of accomplishment in the art. These days, I don’t have time to practice much of anything. I have a demanding full time job. I entered my 50s a few years ago, and started experiencing all of the dismaying changes that women sometimes experience at my age. This past summer was awful. I felt like I was losing the battle against weight gain, fatigue, and my job required more and more sitting, which resulted in back and hip pain. Even my beloved taiji was no longer gratifying because my knees and back hurt, and I had no stamina. I needed something extra, something that would jumpstart the change I wanted to make to reclaim my health and strength. Enter kettlebells! My very brief exposure to kettlebell training had lingered in the back of my mind. I still had my little 4 kb bells in my house, being used as doorstops. John Du Cane is my taiji brother, and I had seen him a few times at taiji seminars, and he talked about how kettlebells provide a great cross training exercise for martial artists because of the whole body coordination that’s required to swing the bells correctly. Finally one day this past July, sitting in my office at work, feeling tired and unhealthy, I began to Google kettlebells in San Diego. To my surprise, I found a class right down the street! I called and signed up for a couple of private lessons, then began regular classes. I was delighted with the instructor, Farrah Lin. She was certified by John's RKC organization, and in an additional small-world experience, Farrah had seen my husband for a session of Chinese bodywork before! Farrah is a great instructor, and I think the reason I'm so drawn to her classes is because she and her husband George teach kettlebells like my husband and I teach taiji - with great attention to posture, alignment, and generation of power from the hips and legs. I couldn't believe the parallels. Each class taught me something that I could apply to my own taiji practice. One day I realized that the way my knees tended to fall in during the squats was the same way my knees tended to fall in during a transition in a particular taiji move, and resulted in sharp pain in my knees. I had adapted that taiji move over time to avoid the pain, and lost strength in the move as a result. I went to taiji class that night and corrected that move, and from that point, my knee pain diminished and now, it's completely gone. My taiji is stronger and more powerful. 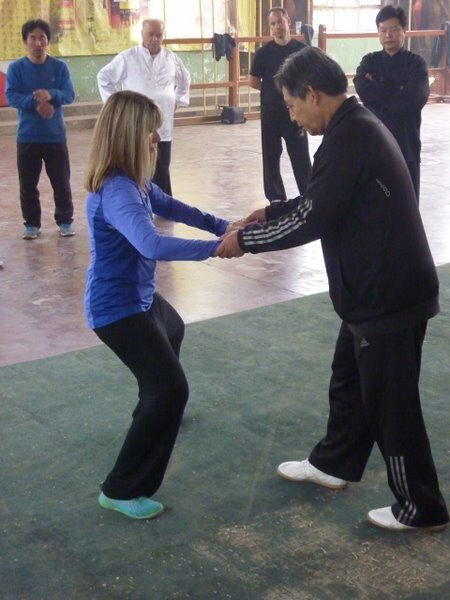 Three months after I started kettlebells, I went to China for intensive training in Chenjiagou, the birthplace of taiji. I sailed through the training like never before - 5 hours a day, slow grinding form, standing post for an hour a day, reeling silk exercises for an hour a day. On past trips, I have fallen out partway through, taken a day off, rested way more often than is acceptable, cheated with high stances. This time, I felt stronger than ever. 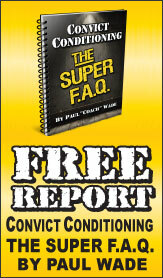 I am absolutely positive that this change was from the kettlebell training. Kettlebells have strengthened my overall body coordination, twining and twisting movements, and hip and leg strength. My core is stronger and is able to sustain the exertions of the discharges of power in the taiji form. 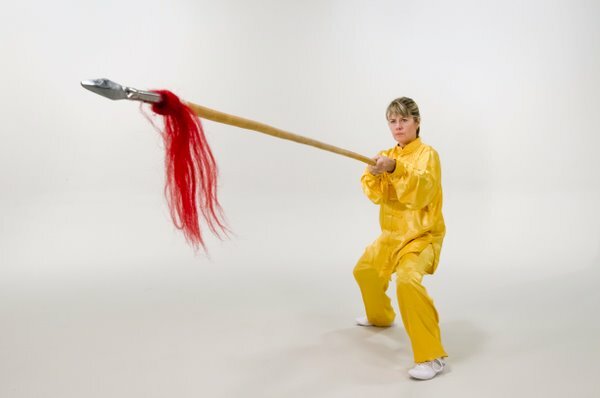 I can perform the weapons forms without fatigue now, including the long pole form, using an 8-foot waxwood pole to slap the ground and strike out in powerful spearing motions. Other changes have come as well. I have lost 9 pounds. I have shed fat and firmed up. I no longer have joint pain in my hips and knees. I can squat to pick something up from the floor with no problem. I can walk long distances, hustle up stairs, and carry heavy bags. I was motivated to change my diet, because bad food made me feel awful during the morning kettlebell classes. I now look forward to class. I attend 3-4 times a week in the morning, and my taiji practice feels and looks better than it has in several years. I am beginning to feel like I did when I was a woman in my late 30s, at the peak of my strength. I can honestly say that kettlebells have been instrumental in regaining my health. In a perfect world, I would work out all the time, practice taiji several hours a day, but the reality is that I can't do that. I can attend kettlebell classes for 45 minutes, a few times a week, and with that, I am on the road to achieving my goals of strength, power and optimum health. I would highly recommend kettlebell training to women of all ages, in all shapes and sizes, and in all states of health. I didn’t think I would see these kinds of gains in such a short time, but I am a believer now, and kettlebells will be a part of my life for a long time to come. 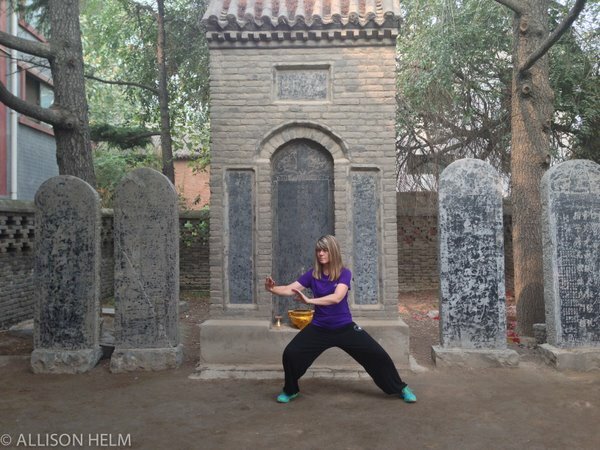 Allison Helm is a 20th generation disciple of Grandmaster Chen Xiaowang. 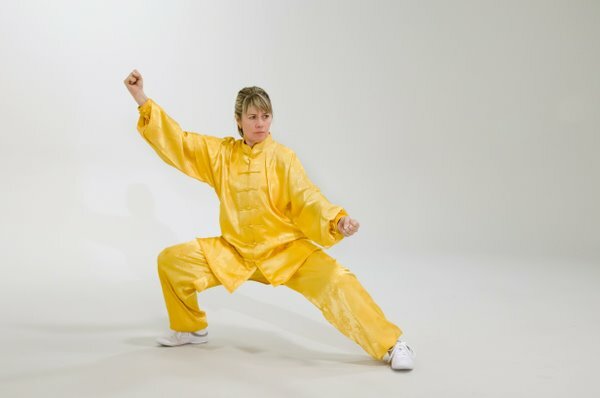 She is the Senior Instructor at the Taoist Sanctuary of San Diego, an official branch school of the Chenjiagou Taijiquan School in Chen Village. Visit www.taoistsanctuary.org to reach Allison or for information on classes and workshops.